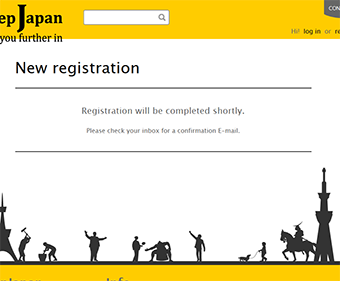 Deep Japan is a site that brings visitors a bit further in to a more local and real Japanese experience. We have 100 plus experienced "Senpais" who answer interesting and unusual questions about how to enjoy a visit to Japan in an even "Deeper" way. Visit Deep Japan often to receive cool tips on "How To", "Recommend" and "Knowledge" from your Deep Japan Senpai community. “The Senpai is someone who lives and works in Japan and can give you advice and recommendations to guide you through your stay in Japan. If you have a lot of experience in Japan, you can become a Senpai yourself! The advice from our Senpais gives personal tips and information on how to make your stay in Japan a bit more fun and interesting. How to use the convenience stores, where to participate in festivals, recommended shopping areas, the Senpai advice is from their experiences. To search the site for specific advice, enter the keyword of what you are interested in learning about at the top of the homepage. This way, you can view various advice posts from the Senpais. On the sidebar of the site, you can select from one of eight categories to narrow down your search. 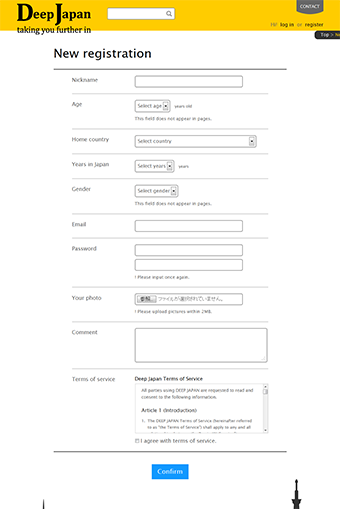 After confirming, you will receive an e-mail from Deep Japan. Click the URL in the e-mail to complete the process. (1) Always Ready to Receive Your Theme Ideas! At Deep Japan we also gather interesting advice on topics that are seasonal, popular or just simply hot hot hot! If you have certain knowledge or information...or...even a very special photo you are proud of, please contribute via the "Special Theme" function. Click on the "Post Advice" button and tags the DJ viewer community wants to see will appear automatically. You can go on ahead and click "View" to take a look at the list of advice posts submitted under that tag. (2) Create Your Advice Post Title! In the "Title" Section go ahead and create a unique title for your advice post (keep it within 100 letters). Too long and less people will read it, too short and your message won't get across. Make it fit just right and hook the world on the info you want to offer. (3) Your Headline and Text Go Here! Each advice post can have up to three paragraphs and your sub-headline can go above the second paragraph. If you dont neet a sub-headline, feel free to disregard this section. ・Make sure to include the entire URL address starting from"http://" on any link you include in your text. The link will be recognized automatically and become a hyper link to the URL you've pointed to. ・Just FYI, HTML tags can't be used and will appear as text in your article. You can upload two images max per paragraph and for the advice as a whole, one photo is required. ・Upload images from your PC by dragging the image and dropping it in the space provided. If you are unable to drag and drop from your browser or smart phone, etc., click the place where you want to insert the image and then select the image you want to upload. Depending on your smart phone, you might be able to take photos with your camera already in operation. ・Please include a description of your image in the space provided. You can skip this step if you prefer. ・Image files can be up to 8MG and size should be within 0000 pxl x0000pxl. Images exceeding this limit should be re-sized before uploading. Upload images in the GIF, JPEG, or PNG format. (5) Add a Paragraph to Deepen Your Post! Click "Add paragraph" and a new section for your text will appear. 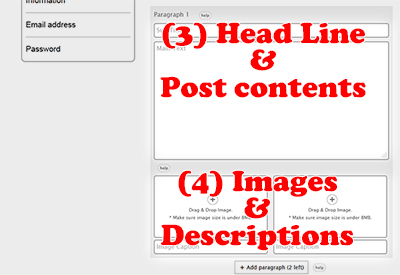 The new paragraph section will have a space for headline, text and two images just like your first paragraph space. ・Only want to add a photo? No problem! Simply upload your image and disregard the headline and text section in the new paragraph. Don't forget though, there needs to be text in at least one section of your post. ・If the number of paragraphs is not enough, dont try to force everything in... the best thing to do is post in chapters on a specific topic i.e. "Your Headline Part 1" in one post and "Your Headline Part 2" in the next post. This is where you can select the category for your post. There are eight umbrella categories featuring three sub-categories each. (7) Go Ahead and Tag Your Post! For searches and recommendations, a tag is amazingly helpful! For more people to easily locate your advice post, a few pertinent and appropriate tags can definitely give your post a boost. Tagging is fun, so give it a try! On one advice post, you can add up to 10 tags. When you finish writing your text, the system will automatically present matching tags for you to consider. The number you see next to the tag shows how many other advice posts have that same tag. Simply delete a tag by clicking "x" if you dont like the tag that appears automatically. Once you select a tag, some other tags for you to consider might appear. If you think these tags fit your text well, you can go ahead and add them in by giving them a click. If there are not enough tags, feel free to add some yourself. You can input a tag and a few possibilities will show up. If the tag you want appears, go ahead and click it to add to your tag lists. If a good prospective tag does not show up, click "Add Tag" and your new tag will be registered on the system. 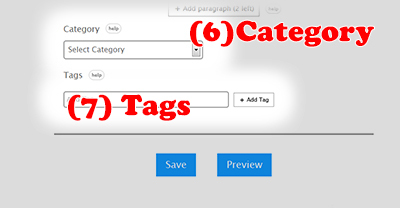 In your tag, you can include alphabet letters, numbers, hyphens, underscore and spaces in your tags. For one tag you can use up to 32 letters. When you registere a new tag, you might be presented with the "Did you mean.....?" which will give possible correction options for your tag. If you click this, the tag will be revised and if you prefer to keep the tag you've typed, simply disregard this suggestion. “Share your Advice with your social network! * Be logged into your SNS in advance. You can edit or delete your advice post from the “Your Post History page” on the left menu of the Senpai page. If you have a question or concern, please use the Contact page to send us an inquiry. Please note the terms and conditions regarding your advice posts terms.